Wahunsenakah Lodge held their annual Winter Banquet on Saturday, December 13, at Chestnut United Methodist Church in Newport News, and issued a colorful 3" round patch to mark the occasion. The special guest speaker for this year's banquet was Admiral Joel R. Whitehead, United States Coast Guard Commander of the Eighth Coast Guard District, New Orleans. Back in 1970-71 he was better known by his nickname of "Corky" and his title was Chief of Kecoughtan Lodge 463. In keeping with this year's "cartoon duck" theme the solid-embroidered patch design features three yellow ducks around a candy-cane striped "North Pole." The W's on this patch are ghosted into the design so well you will need to look hard to find them all (they are located at 3, 6, and 9 o'clock positions). This makes the tenth consecutive year that Lodge 333 has issued 5 activity patches during the calendar year. In 1997 and 1998 (the first two years of the Lodge's existence) the Lodge did not hold a Fall Fellowship event, so only 4 activity patches were issued during those years. Thanks once again to Larry Johnson for contributing the picture of this patch. While scouring a long-stored hard drive I came across scans I made back in April, 2007 of 5 editions of the Section SE-1 Chatter newsletter. I've created PDF versions of each and they are now available on the SE-1 emblems page for your reading pleasure. Thanks to former Kecoughtan Lodge Chief Morris Friedman who generously loaned me the copies of the SE-1 Chatter newsletters (along with several editions of the Kecoughtan Kryer) to scan and make available on this web site. Larry Johnson just returned from the Wahunsenakah Fall Fellowship, held October 24-26 at Bayport Scout Reservation, and sent me a nice image of the patch issued for that event. The emblem continues to feature the "cartoon" yellow duck from the earlier 2008 activity patches, this time in a rope swing suspended from a tree with few remaining leaves. You can view this patch and all of the Lodge 333 activity patches, on the Wahunsenakah Lodge Activity emblems page. After uploading the image to the site I discovered that many of my PHP scripts were no longer working so the nice zooming and lightbox picture effects were broken. My web site host upgraded their servers awhile back to PHP5 and recently removed PHP4 entirely, so I need to do a little housekeeping to get everything back in working order. 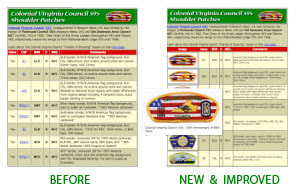 I've revised the shoulder patch pages for Colonial Virginia Council to include thumbnail pictures of each emblem and to split the Jamboree shoulder patches onto their own page separate from the CSPs and SAPs. JSP's aren't included in An Aid To Collecting Selected Council Shoulder Patches With Valuation Guide 2008 Edition by Austin, Ellis, & Jones, so it only made sense to give them a page of their own. The new pages feature the ability to click on the thumbnail image to view a larger picture of the patch, and even allow you to zoom multiple images to compare them for differences. Eventually I plan to revise all of the patch pages to include thumbnail pictures to make patch identification and comparisons much easier. Let me know if you spot any typos or can contribute any additional information to make the data provided more complete! Michael McCaughan of Blue Heron Lodge kindly sent me pictures of items issued at the recent SR-7A conclave, hosted by Shenandoah Lodge at Camp Shenandoah from April 25-27. 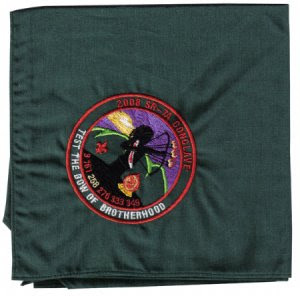 In addition to the participant pocket patch you will find images of the jacket patch, pocket patch, pin, passport booklet cover, and embroidered neckerchief on the SR-7A Emblems web page. The impact of the recent economic downturn was evident when I originally sought pictures of these items from several conclave attendees and was told by each that they decided to reduce on their usual conclave memento purchases after high priced gasoline made traveling to the conclave so much more expensive. The design of the patch includes a clever insertion of the "WWW" found on Order of the Arrow flaps. Look closely and you'll find it in the flaming arrow tips. 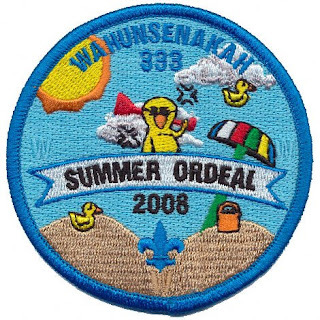 Wahunsenakah Lodge 333 held their 2008 Summer Ordeal this weekend, and commemorated the event with a nice fully embroidered three inch round patch. Member Larry Johnson kindly sent along a picture to add to the Lodge 333 Activity Emblems web page. 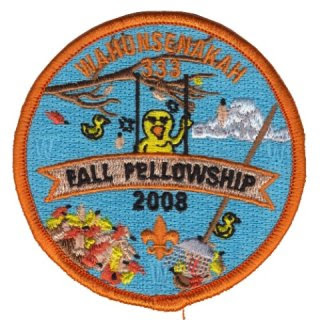 This is the third activity patch of 2008 for Wahunsenakah. The Lodge has issued 5 activity patches per year since 1998 for the following events: Winter Ordeal, Spring Ordeal, Summer Ordeal, Fall Fellowship, and Christmas/Winter Banquet. Although Wahunsenakah 333 was formed in January of 1996, a Fall Fellowship was not added to the Lodge calendar until 1998, so only 4 activity patches were issued during 1996 and 1997. Larry Johnson kindly sent me images of all of the patches issued for the 2008 summer camp sessions at Bayport Scout Reservation, Colonial Virginia Council's camping facility that opened in 2007 to replace Camp Chickahominy. The new issues are pictured in the animated image above and include a standard pocket patch available to everyone (black border), a blue bordered variety for campers, a white bordered staff issue, and finally a Rivah Base issue with blue border and "RIVAH" lettered on the tower. For larger images and pictures of the 2007 patches issued for Bayport see the Colonial Virginia Camps page. Recently I discovered a neat new way to zoom images from a web page and thought I would try implementing it on my web site to see if it would be useful for displaying thumbnail images of patches that enlarge when clicked on. The best part is that you can have multiple images open at the same time for comparison. The first page I tried this on details the special shoulder patches that have been issued by Colonial Virginia Council for their Friends of Scouting donors. I noticed that several of the patch designs were inspired by Norman Rockwell paintings and thought it would be cool to provide images of the patch and the corresponding painting to illustrate the source of the design. Give it a try and let me know if you run into any issues. So far it works fine on my MacBook Pro and even on my iPhone. Is it an issue, a variation, a fake, or a mistake? There is an auction for a flap from Wahunsenakah Lodge on eBay right now that would puzzle most collectors not closely familiar with the patches from this Lodge. The patch up for bid is a lodge flap that was issued for the 1998 SR-7A conclave, and if you look in the Blue Book you'd see that that issue is classified as the S-8. OAimages.com values the S-8 between $2.69 and $14.89 with an average value of $7.16. Even though the flap is ten years old it's considered a fairly common item and an easy find for your collection if you need it. So why is this auction showing a current high bid of over $100 with over 4 days left to go? I'm not sure how many of the S-8 flaps with black FDL's exist, nor how they came to be in circulation. More than a few OA flaps have been duplicated by Asian patchmakers and sold on eBay but this hardly appears to be the case here. The most obvious explanation would be a manufacturer's error. I am fortunate to have one of these in my own Wahunsenakah collection, but it was sheer luck and not because I sought it. I always considered it just an error item. Some would argue that this flap should be listed in the Blue Book as a variation, e.g. S-8b. I am not sure that I can agree with that since I don't know the history of the flap. If the Lodge received some flaps with black FDL's and sent them back to the manufacturer as misprints and received credit or replacements with green FDL's they probably never intended the black FDL versions to reach the public. Similarly they may have been samples that the Lodge returned with a revision request to the manufacturer, and somehow the samples got out. Are they still an "official" Lodge 333 issue? Regardless, it appears that for collectors who seek one of every Wahunsenakah Lodge flap this has already become a highly sought after patch. If you have information about the history or scarcity of it, please share it with me! Larry Johnson kindly sent me a picture of the 2008 pocket patch for Bayport Scout Reservation, the camp serving Colonial Virginia Council that replaced Camp Chickahominy. The new design is a cut edge issue with black border and features a compass, the camp tower, and a sailboat. There is also a blue-bordered participant variation of the pocket patch which I don't yet have a picture of. If you can provide one please let me know! You can view all of the Bayport and Chickahominy patches in the Council Camps section of the Kecoughtan Emblems and History web site. Tim Ewing provided me with a picture of the newly issued Kiskiack Chapter pocket patch, first released in June of 2008 with 250 made. The design of the patch is virtually identical to the backpatch issued by the chapter when it belonged to Kecoughtan Lodge. Other than the lodge name change, the obvious size difference, and the loop, the only other design difference is the duck replacing the acorn at the bottom center. 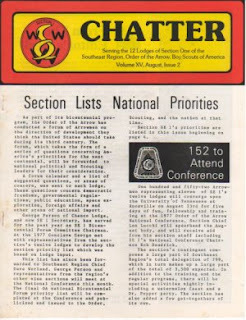 The booklets provided to Section conclave attendees provide not only helpful information about campsite locations, daily agendas, and meal menus, but many years later offer a unique insight into the history of the Section and the lodges that comprised it. I've been fortunate to come across booklets from the 1976 SE-1 Conclave hosted by Guneukitschick Lodge 317 at Sinoquipe Scout Reservation near Fort Littleton, PA and the 1978 SE-1 Conclave hosted by Kecoughtan Lodge 463 at the former Camp Chickahominy, near Lightfoot, VA. Camp Chickahominy was also known as Peninsula Scout Reservation. Both documents are quick downloads in PDF format, and feature painstakingly typewritten content that includes Section and Lodge histories as well as program-related documentation that often seems just as relevant thirty years later. I hope you will take the time to check them out! Larry Johnson kindly sent along excellent images of the Wahunsenakah Winter and Spring Ordeal activity patches to begin the new 2008 section of the Lodge 333 Activity patch page. The winter patch has a cheerful red border with white background reminiscent of snow and features a flying duck and the tower at Bayport Scout Reservation. The FDL is ghosted into the white background. The spring ordeal patch brings back the cartoon-style yellow ducks with a winking duck in a rainstorm, two smaller ducks, and dragonflies with bright green border, FDL, and grass. The new CSP for Friends of Scouting donors to Colonial Virginia Council is now available. This year's theme is Courteous, continuing the 12 points of the Scout Law theme the Council selected when they launched the program in 2003. The patch requires a minimum donation of $75.00 to Colonial Virginia Council. Prior versions have included different borders for Eagle Scouts and United Way donors but this is reportedly the only version available. View and print the 2008 FOS flyer to make a donation. Thanks to Larry Johnson for the excellent picture! Shenandoah Lodge 258 hosted the 2008 SR-7A Conclave on April 25-27 at Camp Shenandoah near Swoope, Virginia. The theme of the conclave this year was "Test the Bow of Brotherhood." Wahunsenakah Lodge issued a colorful delegate flap that nicely mimics the colors and design of the official conclave pocket patch. Thanks to Nathan Light of Nawakwa Lodge for the pocket flap picture and Mike Evans for the conclave patch picture! Wahunsenakah has reliably issued patches for their events since the inception of the new Lodge in January of 1996. Their last patch of 2007 was their 58th activity issue; this one for their Winter Banquet. Larry Johnson was kind to send me a picture which I've added to the Lodge 333 Activity Emblems page. I came across a very cool new bit of code that inspired me to try adding thumbnail pictures to the emblem listings. I've considered adding these small images to help make it easier to identify an issue, but planned to wait until the site was converted from static web pages to one powered by a database. But after I saw the very cool effects and options presented by highslide I had to try it out to see what the addition would look like. You can check out this sample page to see the results. Let me know in the comments if you think it's a positive change!